One of the nights that we were in Orlando, we went up the Orlando Eye – a large Ferris Wheel. It is now called the ICON Orlando. It was about an hour long experience, but since we did it at sunset time we had an amazing time. It was light when we started and dark when we were finished. The color scheme for this spread is based off of the colors of the photo cover on the right hand page – purples and pinks. 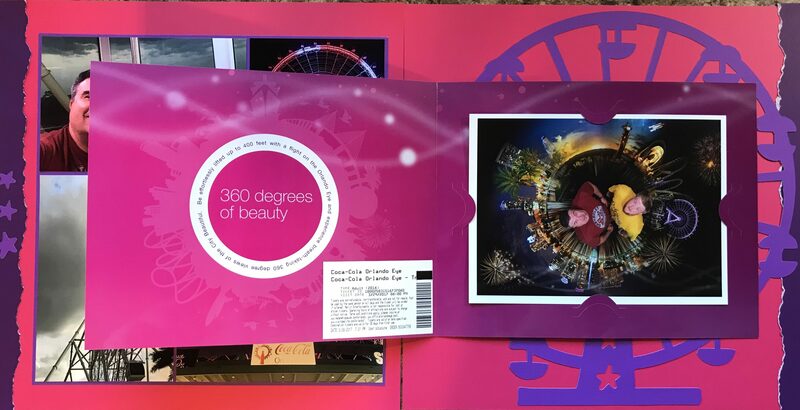 I chose a pink background paper, and then used purple to border the pictures, for the spread borders, and to cut out a Ferris Wheel with my Cricut Machine. The purple stars on the left hand border are the cutouts from the Ferris Wheel on the right hand side. There is a pressed penny in the middle of the pictures on the left hand page. I placed the professional photograph from the experience on the right hand page, and you can see what it looks like open in the picture below. I also put the ticket from the event on the inside of the photograph cover to record the date and time of the event. For instructions on how to create an opening folder on a scrapbook page that used plastic page protectors read my blog on How to create an opening folder on a scrapbook page.